Sometimes life can begin to feel like a re-run. Back in the 80’s, in Thatcher-land, British theatre – and television – started to throw up a series of plays reflecting the pinched lives being led by some of its population. Thirty years on, in a new wave of `austerity’, similar reflections are emerging. 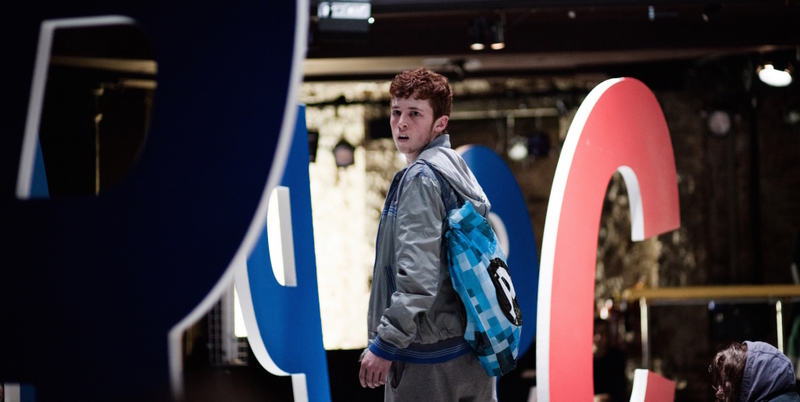 If Jim Cartwright’s `Road’ and Alan Bleasdale’s Boys from the Blackstuff were redolent of their times, recent Royal Court plays such as Yen, Beyond Caring (at The Yard, later at the National Theatre) and now Leo Butler’s Boy could be said to be this era’s postcards from the edge. Boy tells a story, a shocking one and comes as much through visuals as through words. On a circular carousel, we watch sixteen year old Liam moping about with nothing very much to do, in various situations, all of them awkward. All credit to the stage hands installing front doors, bus stop shelters and Oxford Street signage who play as important a part in the action as the large cast portraying schoolgirls, drug dealers, bouncers, harassed GPs, neighbours and the rest. A short, sharp slice of London life, Sasha Wares’ production leaves little to the imagination. It’s tough, ugly and viscerally charged, conveying the grungy existence of a boy with no future. Boy is a reminder that more attention must be paid to those forgotten white, working class school leavers with no skills and less hope. Butler is not afraid to apportion blame and Boy is unashamedly partisan in the way Road and Boys from the Blackstuff also laid it on the line, in this case using Liam as a symbol of national malaise. 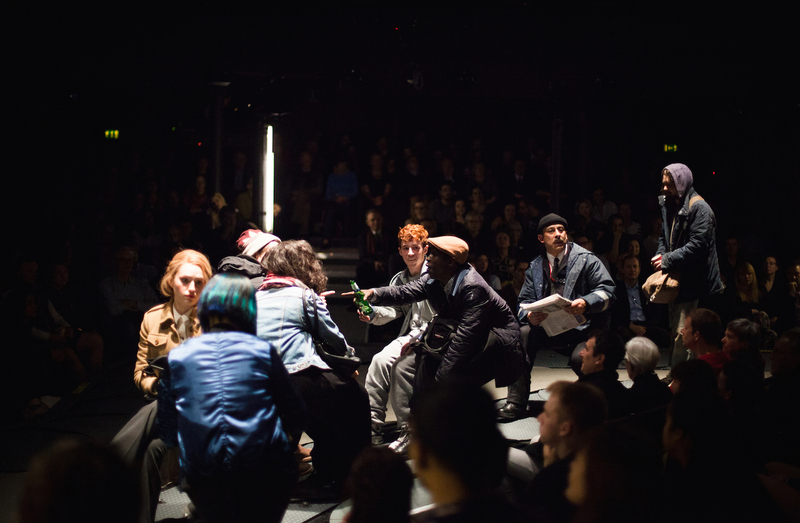 Uncomfortable to watch, it is however surely the kind of work the Almeida should be doing, bringing the real world onto its stage. Five minutes outside on the street confirms the extraordinary verity of what has just transpired, art truly reflecting life. In a large cast of experienced and young performers, Frankie Fox’s scrawny Liam with the hang-dog expression of one all at sea, is a portrait hard to forget in a hurry. You just want to give him a hug and help him forward. 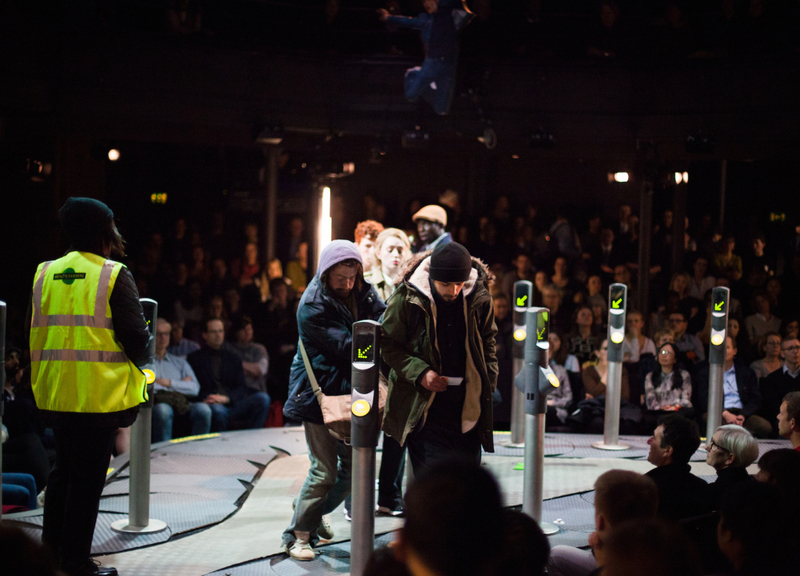 This entry was posted in 2016, Reviews and tagged Alan Bleasdale, Almeida Theatre, effect of austerity on young lives, Leo Butler, poverty, Road, Sasha Wares on April 16, 2016 by Carole Woddis.